After graduation, he started working full time at Dianella Community Health and part time (evening and Saturday sessions) at Bundoora Dental Clinic. He gradually increased to working full time at Bundoora Dental Clinic while maintaining the evening and Saturday sessions. In August 2011, he acquired partnership at Bundoora Dental Clinic. 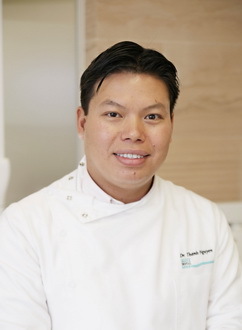 Dr Thanh Nguyen enjoys all aspects of dentistry especially cosmetics work. When not working, he loves spending time with his parents and family, especially his two young daughters. He also likes reading science fiction and enjoys some badminton and tennis games on the weekend.